Regularly sealing cracks is an essential part of any pavement maintenance program, but what do you do when crack sealing just isn?t enough? The traditional pavement preservation program leaves a gap between crack sealing and repaving, and, in terms of cost, that gap is enormous. Wide cracks, pavement fatigue, deteriorating shoulders and seams, raveling, rutting, depressions, potholes, and irregularities litter our streets and pose a serious threat to the integrity of our pavement and the traffic it supports. But Maxwell Products has closed that GAP™. 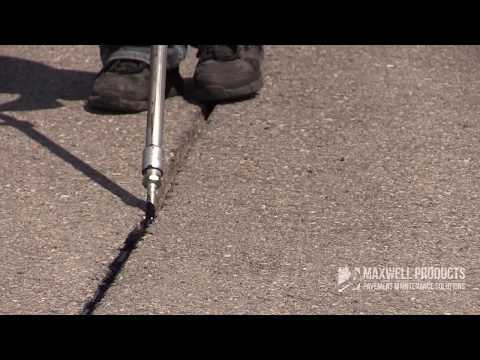 Maxwell Products introduced the GAP brand of hot-applied pavement maintenance products to address the problems too big for crack sealing and to be an effective, economical alternative to repaving. GAP Mastic and GAP Patch do more than just repair pavement, they upgrade it. Flexible: GAP materials employ a highly flexible, thermoplastic, asphalt binder. This creates a repair that moves with the surrounding pavement, not against it. Adhesive: Proprietary inteliBondTM technology allows GAP products to create a solid, thermal bond with the pavement, sealing out water and ensuring a long-lasting repair. Durable: GAP products employ high-strength, engineered aggregates, which deliver a more permanent, impact-resistant, load-bearing repair. Convenient: Maxwell Products packages GAP brand materials in patented, industry-leading PolySkin™. This unique, fully meltable packaging solution reduces cardboard waste and improves safety and melting time. GAP Mastic is a budget-saving, versatile, hot-pour solution for wide cracks, shallow cupping and depressions, fatigue cracking (alligatored areas), small voids and potholes, open seams, and more. This product is designed to bond tightly to surrounding pavement, seal out water infiltration, and handle vehicle and pedestrian traffic, snowplows, and weather so well that it?s easy to forget a problem ever existed. What makes GAP Mastic different from other mastics on the market? Flexibility: GAP Mastic binders have been shown in laboratory tests to typically stretch 700% before losing adhesion. GAP Mastic simultaneously accommodates thermal movement and seals out moisture. Penetration: GAP Mastic is less viscous than other mastics, allowing the material to penetrate deeper into cracks, crevices, and voids without bridging. Ease of application: Because of its proprietary formulation, GAP Mastic is easier to apply. Crews can easily manipulate, smooth, and adjust GAP material prior to setup. ?The GAP Mastic material we used in late November  has performed real well,? said Raymundo Elias, retired Caltrans District 4 Area Superintendent. ?The results are far better than the conventional material used to seal the crack. The longitudinal, wide crack was a real problem to bicyclists and motorists traveling along Woodside Road, and it seemed to swallow anything we used to seal it. The GAP Mastic material adhesion to the sides and the stretching capabilities of the material has kept the material in place.? GAP Patch is a new, robust, hot-pour solution engineered to repair large voids and potholes. Patch is designed to be a stronger, more cost-effective, enduring repair, allowing crews to fix a problem once and move on. What makes GAP Patch different from currently employed patching products? Adhesive strength: GAP Patch bonds firmly to surrounding pavement and remains solidly in place. Cohesive strength: Because of the polymer-modified, thermoplastic asphalt binder, GAP materials remain bound together. GAP Patch doesn?t come apart or ravel out within days (or hours), leaving an unsightly mess of material. Impact resistance: GAP Patch employs high-strength, engineered aggregates that suspend well, creating a reinforced, homogeneous material. The applied GAP product provides better traction and resists pushing, shoving, and slippage. Flexibility: GAP Patch binders have been shown in laboratory tests to typically stretch 500% before losing adhesion. GAP Patch simultaneously accommodates thermal movement and seals out moisture. Additionally, GAP products have helped government agencies, municipalities, and airports in Utah, California, Minnesota, Nebraska, Washington, Wisconsin, and Idaho address their pavement problems. Maxwell Products? GAP Mastic and GAP Patch are proven, reliable, and permanent solutions for pavement distress that goes far beyond simple cracking. GAP materials greatly reduce cost, restore the pavement ride, and effect stable, durable, moisture-sealed, load-bearing repairs.